The fire has burned steadily since Dec. 4, and it could take weeks to contain. The Thomas fire, which has killed two people and destroyed more than a thousand structures in Southern California, could become the largest wildfire in the state's history as the monster inferno continues to grow. The fire led to the deaths of 70-year-old Virgina Pesola, who perished in a car accident while attempting to evacuate, and a 32-year-old firefighter from San Diego, Cory Iverson, who died from burns and smoke inhalation. Intensified by erratic winds and superdry conditions, the fire has burned at least 270,000 acres in Ventura and Santa Barbara counties, making it the third-largest wildfire in modern California history, according to the California Department of Forestry and Fire Protection. The largest fire on the department's list, which dates back to 1932, is the 2003 Cedar fire, which charred more than 273,000 acres and killed 15 people. The Thomas fire has burned steadily since Dec. 4, and authorities say it could take weeks to fully contain. It has reduced at least 1,026 homes and business to ash and damaged more than 240 others. It was 45 percent contained as of Sunday evening as about 8,530 firefighters from about 100 crews battled the blaze. Officials estimated that firefighters won't achieve full containment until Jan 7. The state has spent more than $123.8 million on efforts to suppress the Thomas fire, which has also knocked out power lines to thousands of residents, authorities said. (Robyn Beck/AFP/Getty Images) Firefighters from the Governors Office of Emergency Services monitor the advance of smoke and flames from the Thomas Fire, Dec. 16, 2017 in Montecito, Calif.
At least 104,000 residents have been displaced since the start of the fire. Nearly 18,000 homes and business are at risk in Santa Barbara and Ventura counties. Dry Santa Ana winds gusted to up to 65 mph on Saturday, causing the blaze to flare up near the upscale town of Montecito, but firefighters said they made a lot of progress on Sunday. "We kind of had a 'bend, don't break' philosophy, and that's what we did," Cal Fire Capt. Sean Norman told reporters. "We took the push from the fire, and we pushed back, and once that wind let up, we immediately went after it with our hand crews and our dozers to try and get around the place where it pushed us." 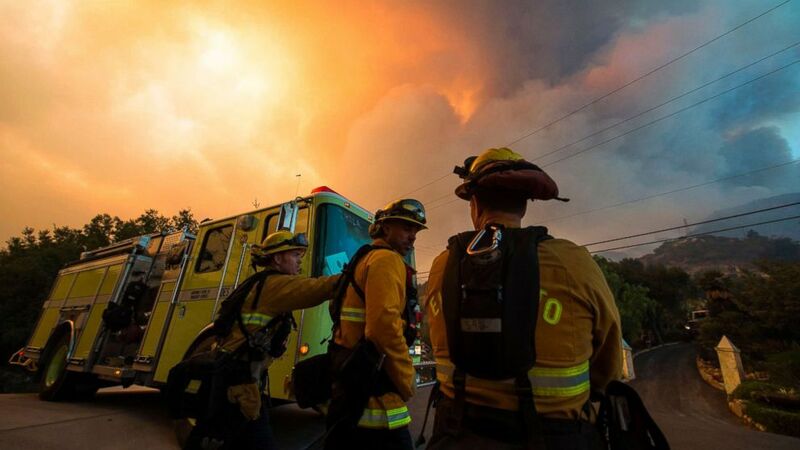 "California has the most robust firefighting entity in the world when we all come together. Our mutual aid system is unparalleled," he added.